Pro audio indeed Ever seen a movie screen? No, not the movie. The screen. It's huge, when you get right up to it. You'll notice that it has holes in it. This is to let the sound out. Behind the screen, you see the movie backwards, and you see where the sound is coming from. If the theater is more than about 20 years old, the sound is probably coming from Altec horn speakers. These have woofer cabinets the size of Porta-Potties, and 4-foot tweeters that look more like space ship weapons. They're mounted high up on platforms, booming out thunder from above. Any made before the end of World War II have electromagnetic field coils. Unless you power-up the tube rectifiers before the show, you've re-invented silent pictures. Until Altec was dragged down, down, down, ever farther into late-20th-century capitalist Hell, it was the outfit putting the bop in the bop shoo bop shoo bop, and the whang in the whang a danga ding dang, at your movies. This has never been a business for the faint hearted. Movies cost megabucks, and theater presentation is where producers and exhibitors alike win or lose with the audience. Nobody's going to stand around and let the equipment screw up. From the beginning of the talkies, one of Altec's several incarnations was there with the technical chops to make it work and keep it working. As the company branched out into broadcasting, recording, public address and "Golden Age" home hi-fi, it was the same - straight-ahead, gimmick-free engineering, designed to specs rather than prices, and supported with extreme professionalism. Along with JBL (James B. Lansing, who worked at Altec for a time), Altec WAS pro audio. Yes, you can buy A7s again ($5800 +$300 shipping per speaker, some assembly required). When Altec puts "The Voice of the Theatre" on speakers, well, they've earned it. They still own the trademark, as well they should. Back when Jolson told audiences that they hadn't heard nothing yet, they really hadn't. Sound movie technology wasn't much past home radios. RCA, DeForest, et. al. had gotten pretty good at these, but the only way low-power amps and primitive speaker drivers could fill auditoriums with anything resembling audible sound was to use Western Electric PA horns, the World War I "loudspeaking telephones," developed at Bell Labs. These "snail horns" were outlandish spiral contraptions looking more like giant sea shells. If talking movies were going to be more than a gimmick, music had to sound better than at home, and voices had to be intelligible. Western Electric rather quickly invented the 3-way speaker. It had a 4x18" woofer on a rather inefficient open baffle, a super-efficient double midrange (the snail horns), and a 2x direct-firing tweeter. You get the idea. They had also invented driver mismatch and time distortion. The midrange sounds in your epic movie had 12 feet farther to go before they could get out into the auditorium, entertain the audience, and make you some money. Forget phase smearing. Try tap shoe sounds coming out of the thing twice! Not good. Dialogue had obvious problems as well. Giving your paying audience a headache is not a highly recommended presentation technique. MGM always had lots of tap dancing in its movies, and they were most definitely interested in something better. Western Electric got them together with the chaps at R&D powerhouse Bell Labs, which of course had years of experience in getting voices to sound right. Along with several other talented people, they brought in James B. Lansing, yes, that J.B. Lansing, because he was making drivers that were up to the challenge. The result was the 2-way Shearer System, with bass and treble horns, and the movie speaker was invented. It was 50% efficient. 10 good, clean, honest, tube watts would rattle the theater and then some. The system won an Academy technical citation in the mid-1930s. American movie speakers would not change fundamentally until the early 1970s, and then only because they had to, when theaters moved into neighborhood shopping malls designed for commerce, not entertainment. This was, by and large, what saved the feature film industry, but of course it doomed large bass horn speakers for many applications. Today, then, your average neighborhood picture-show speakers are nothing remarkable, though they are still well engineered. They are essentially large, direct-radiating woofers in very shallow, ported boxes, with short treble horns. They make up for any loss in efficiency by using ultra-power, solid state amps, up to 1200 watts in some bi-amped systems, and more attention to subwoofers and boom tracks. Other deficiencies are addressed in the design of the electronic crossover. This becomes the make-or-break of the whole system, which is why THX leases out their own. Arguably, despite all the whoop-de-doo new technologies for movie sound, the playback in the standard, non-Dolby, non-THX, neighborhood theater has actually gone downhill. This is because nothing at all is new in movie sound, except for digital audio (an arguable improvement at best), and the new flat-panel speakers, a dynamic with no cone, perfect to sandwich between the screen and a wall. Stereophonic sound? Demonstrated at Bell Labs in the 20s. Noise reduction? Invented early on, to cut optical hiss. High fidelity? Western Electric triodes in class A single-ended configuration are still widely considered the cleanest devices known. Biamplification? Old hat. Time alignment? Old hat. Multitrack? Old hat. Electrostatic speakers? Patented by Kellogg, 1929. Color? Old hat; ask the Munchkins. Ultra-wide screens? Done in the silent era with three synchronized projectors, just like early Cinerama. Subwoofers and sub-bass tracks? Sensurround, 1974. Dolby? Well, yes, this is a good system, with some clever technical hacks, but still basically a better way of doing optical and magnetic analog sound, and 70s besides. Even the mighty THX is, at core, a set of standards for presentation, plus a radical refinement of analog technology with an increasing number of digital embellishments. If movies sound better, it is because people want them to, and are willing to spend the money, not from any new technical miracles. Getting back to the Shearer horns, MGM bought 12 of these speakers for its Leow's Theatres. Lansing marketed his own version, under the "Shearer System" name, but bigger and with his typically fanatical attention to craftsmanship. It had two of the big bass horns, sitting side by side, high up in a wooden frame, with large deflector baffles on either side. (These "wings" address the nondirectionality of bass; their absence is one deficiency of "modern" theater speakers.) Far up on top, the multicellular horn fired megasound at the unsuspecting masses. RCA marketed its own version as part of the Photophone system, and Western Electric's was the Diaphone. In Germany, Klangfilm marketed a mammoth straight horn with tweeters, becoming that country's industry standard until after World War II. Later, JBL marketed a fairly similar looking design. WE and Westrex (Western Electric Export Company) became dominant, and they were eventually dragged into court by people thinking AT&T was quite big enough already. The resulting settlement created Altec. In 1941, Altec bought Lansing out, and he worked for them until 1946. One result of all this was a new movie speaker called "The Voice of the Theatre," the full line of which was introduced in 1945. The main difference between the VOTT and the original Shearer design was the new model 210 bass box, which front-loaded the 15" speakers with a short flare horn, and back-loaded them with a large, slotted cabinet, putting it somewhere between the true horn and the direct radiator. This was flatter and slightly more phase-linear than the re-entrant Shearer horn, and the bass-reflex cabinet had absolutely no backwave to bounce around backstage. Single-driver HF horns could be mounted with their diaphragms in perfect alignment with the woofers, and the crossover did the rest. All drivers had the new permanent magnets, made of Alnico V (ALuminum/NIckel/CObalt, since replaced by newer alloys). These replaced DC-energized field coils and their bulky rectifiers. Woofers had edge-wound coils, something of a Lansing trademark, and huge magnets. 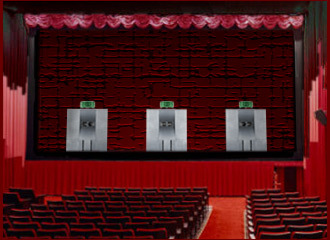 The Voice of the Theatre speakers were scaled to auditorium size and dimensions. Huge movie palaces required the mighty A1-X, a bi-amped system with 6x15" woofers, two gigantic bass horns, and 4 compression drivers into a huge, and hugely expensive, multicellular high frequency horn. This thing was ten feet tall and weighed 2300 pounds. Most theaters, though, got by with the ubiquitous A4, and its single, model 210, bass horn. The 210, and with a few modifications the VOTT line in general, became an industry standard for something like 35 years. With competition from TV, movies had to become bigger and more impressive, and stereo sound became more than a gimmick. By this time, theater chains had been spun off by the studios and were on their own to make it or (increasingly) fail. The bigger ones installed wider screens, more speakers, and impressive racks of tube amps with high power for headroom on explosive sound effects. Years before steppers, and even longer before time code, all manner of devices could be "interlocked," and kept in perfect sync by mechanical selsyns derived from WW II gun aimers. Everybody had three channels behind the screen, and usually a split surround. The big, ultra-wide-screen, Technicolor roadshows of the 50s were on synchronized magnetic film. 35mm fullcoat mag is incredibly expensive, but probably the best analog recording medium ever developed. It runs at a speed approaching 30 ips, (27 to be exact), has at least a 63 dB s/n, allows wider tracks than 1/4 inch magnetic tape, and is sprocketed so it just does not slip. Mag film became popular for hi-fi audiophile demo records, until replaced by direct disk recordings, right onto the cutter. (Analog generation loss is not a problem if there are no generations.) Meanwhile, 70mm magnetic prints were no slouches either, with two wide stripes outside the perfs and two narrow ones inside, allowing at least 6 channels without multiplexing. Something like 50 dB s/n was possible on these tiny tracks, though of course projectionists had to be extremely careful handling prints. "Old" 3-projector Cinerama used five channels behind its wider screen, each one a modified A2 with two horns and its own 75-watt Altec amp, plus up to 20 2-way speakers in the surrounds, fed by 70.7 volt lines! Oof! HERE is a wall of sound that Phil Spector never dreamed of! Multichannel synchronized mag hit its ultimate with IMAX, which in its current incarnation is basically 70mm, 15-perf VistaVision, still using 6-track interlocked mag, though digital (on DVD) is coming up fast. This goes to big, custom PA speakers driven by a massive, 12-kW amp stack for plenty of headroom. IMAX and Omnimax sound pretty damn good too. The audience has been listening for quite some time. Also, as you can see from old rock movies, Voice of the Theater components also wound up in many of the large PA systems that launched the sonic blastoffs of the sixties. This culminated, of course, at Woodstock. After the festival lost its initial site, someone recommended they bring in Bill Hanley Sound to handle the expected 150,000 people (we know how low THAT estimate turned out to be). Hanley, a visionary engineer who had done a Beatle stadium tour, and who also had a hand in developing the now-ubiquitous "wedgie" stage monitors, picked the exact position of the stage on Yasgur's Farm. He assembled a custom system on a scale rarely heard of at the time, out of Altec and JBL components, but mostly Altec. Sometimes, as in the case of the legendary A7, Altecs wound up absolutely everywhere. The A7, a smaller bass horn/reflex box crossing over at 800 or 500 Hz to a 4-cell sectoral horn, became pro audio's Model T. It has to be the most recognizable pro speaker ever made. Not necessarily the best sounding, you understand, but certainly the most recognizable. They still turn up in big studios, at gigs, in clubs, and, heavily modified and fussed over, even in DIY audiophile's garages. One sculptor makes a fancy cabinet out of furniture wood. Someone even has a full-size stone picture of this speaker on their grave marker. No wonder the successor company called Altec Lansing Technologies still offers a "legacy" A7 limited edition, for anyone with $6000 per speaker (you can buy them online!). 1945	 A1	 2 huge horns, 3x15" ea 1 hf w/2 drvrs	 10'x 10'x 4', 2200 lb. 1945	 A1-X	 2 huge horns, 3x15" ea 1 hf w/4 drvrs	 10'x 10'x 4', 2300 lb. 1945	 A2	 2 210 horns, 2x15" ea 1 hf w/2 drvrs	 10'x 9'x 4', 1300 lb. 1945	 A2-X	 2 210 horns, 2x15" ea 1 hf w/4 drvrs	 10'x 9'x 4', 1500 lb. 1945	 A4	 2x15" in 1 210 horn	 1 hf w/1 drvr	 9'x 7'x 4', 800 lb. 1945	 A4-X	 2x15" in 1 210 horn	 1 hf w/2 drvrs	 9'x 7'x 4', 825 lb. 1945	 A5	 1x15", smaller horn	 1 hf w/1 drvr	 9'x 7'x 3', 550 lb. 1945	 A6	 15" Dpx, smallest horn	 Coaxial	 9'x 4'x 3', 425 lb. 1947	 800	 15" in 825 horn + port	 H808 horn, 1 drvr	 6'x 4'x 2', 296 lb. 60s	 A9	 Inf. Baffle 2x15"	 1 horn, 1 drvr	 8'x4'x2', 510 lb. 60s	 A10	 Inf. Baffle 4x15"	 1 horn, 1 drvr	 9'x6'x2', 815 lb. 1983	 A1	 3 210 horns, 2x15" ea	 1 horn, 2 drvrs	 9'x12'x4', 1674 lb. 1983	 A2	 2 210 horns, 2x15" ea	 1 horn, 2 drvrs	 9'x10'x4', 1165 lb. 1983	 A4	 1 210 horn, 2x15"	 1 horn, 1 drvr	 8'x7'x3', 640 lb. 1983	 A4-X	 1 210 horn, 2x15"	 1 horn, 2 drvrs	 8'x7'x3', 655 lb. 1983	 A6	 Ported, 2x15"	 1 Mantaray horn	 4'x3'x2', 150 lb. Was there ever an A3? Can't find one in mfr literature. Every part in the VOTT line changed at one time or another, but general config stayed similar. 1983's A1 had changed from 2 large horns to 3 210s. Later A1s were biamped. Multiplex mall theaters have little backstage space, hence the gradual switch by the industry to 2-3' depth. The 825 horn/port enclosure was used in the A5 and A7, and was replaced in the 70s by the 828. Some audiophiles think the 828G version is the flattest. A7, A7-500, and the reissue have option to mount the horn in the bass port. In fact, the reissue ships this way, and the user remounts the horn on top for best sound. "Magnificent" was a home version of the A7-500, in a fancy walnut box with a curved grill. The A10 was actually certified for THX. Custom installation at the famous Cinerama Dome, Sunset and Vine, Hollywood, CA. A2s, but note the double horns for 180-degree dispersion. The split-surround auditorium here is unusually short and wide, fitting inside a deeply curved screen, and all housed in a true, Bucky-Fuller-style, Geodesic dome. The vertical lines in this original screen were due to its construction out of carefully placed strips, which solved a problem with light bouncing back onto screens with such extreme curves. The projection booth is long, claustrophobically narrow, and (necessarily) curved. It has Cinerama's three separate boothlets called "Able," "Baker," and "Charlie" (from old World War II radio phonetics), each with its own ports. The side booths at the Dome look a little less claustrophobic than the original Cinerama spec for Able and Charlie, a good thing since all three machines still use operators. 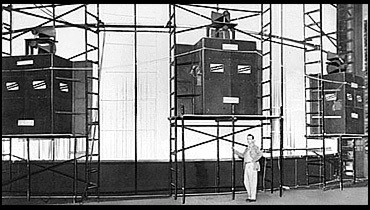 After the Dome's booth was designed, however, Cinerama stopped using this labor-intensive setup, and never installed the equipment. If you saw 3-panel Cinerama in Los Angeles, it wasn't at the Dome. All projection at the Dome was the "new" Cinerama format of single-projector, 70mm anamorphic with additional printer correction for the curved screen and short throw. Of course other 70/35 mag/opt formats could still be shown, using custom projection lenses and some really scary looking aperture plates. It took some fighting to save the old Dome, but it survives, as part of the new ArcLight Cinema 15-plex, next door to another of Hollywood's more amazing scenes at Amoeba Music. Everything, including the screen and the gear you see here, was ripped out in the remodel, but the GOOD news is that we got a 3-panel setup to go with the standard projector! Yes, the booth is now what the good Lord and Cinerama, Inc. intended it to be. Looks like the real, funky, Cinerama gear sitting on giant lamphouses, and apparently using platters. The center machine is the snazzy new electronic kind with no intermittent, but the other two look like good ol' oil-squirting maltese-cross Centuries, muy funky but immortal, with the Cinerama 6-perf frame advance, and fitted with the interlocks and Jiggle-O (Gigolo) frame line blurring thing. You want a scary aperture plate? The Gigolo vignettes the sides of the frame slightly, and vibrates to blur the edge, so it can overlap 2% with the adjacent panel and not be twice as bright. Now keep in mind that 3-strip Cinerama cameras were a cool setup, with their three tiny 27mm lenses the size of human pupils, a HUGE common shutter in FRONT of the lenses, and a 146-degree field to give set dressers and lighting gaffers nightmares. However, if you've ever seen projected 3-strip you know what the registration looks like! No double-pin Mitchell movements here. Yes, there are STILL 3 projectionists on the machines, and they're earning their pay, with hand on the FRAME knob for the whole show!!!!!! Also a sound operator, and a lead engineer/surround operator using an intercom to talk to all of what become three very noisy booths. Sound? Yes, still interlocked fullcoat mag!!!! No platters here. BIG reels (7500'). You'll know you've just projected a show after mounting, taking down, and rewinding a few of these in your shift. Meanwhile, new JBL speakers replaced the venerable Altecs, and there are now 44 speakers in the surrounds! Of course, big corporations aren't about to pop for newly struck Cinerama prints, restored equipment, or any of this. It's partially another labor of love, kind of the exhibition version of rebuilding old transmitters. Some people still remember what REAL motion picture presentation looked and sounded like! Financing, therefore, is a bit like making shoestring documentaries, with a little help from the ASC. The main controversy here is over the screen. The die-hard movie people really wanted another stripped screen, but, alas, this did not happen. Aside from the expense, the problem is that "modern" movie speakers move a lot more air to get the job done than the "archaic" VOTT ever had to. Instant blur on the loud parts. When the revived, 3-strip How The West Was Won screened on the replacement flat screen, it looked great except that you really see the washout around the edges from not having these strips. Otherwise, this is great stuff! We'd be telling half the story if we only talked about Altec movie and PA sound, because the company also came up with the most popular recording and broadcast studio monitor ever. This, of course, is the series of 15-inch DuplexTM speakers known generically as the "604." "Duplex" was, and still is, Altec's trademark for what Tannoy called "Dual Concentric," and Jensen called "Coaxial," though this latter became something of a generic term. Everyone knows the principle. The woofer has a hole in the middle, and out of it comes a concentric horn tweeter using a separate magnet and phase-plug compression diaphragm. Early 604s had a true multicell horn, while later ones had an extended throat, and the several later versions had the Mantaray horn. That's right. They still make this speaker, 60 years later, and it is far from a curiosity or museum piece. Great Plains Audio bought the tooling for the 604-8K from Altec when it imploded in 1998, and it is marketing an updated version. Iconic, another Altec progeny, has one too. There has been a truly dizzying, almost incomprehensible, series of models, component changes, derivations, modifications, and evolutions. This means that a lot of these rugged and easily reconeable speakers are still in use, and audiophiles can spend hours discussing the finer points of various configurations. It often sounds like the kind of talk we hear about old guitars, and with prices to match. All of these sound waves came from one original engineering concept. Early interest in this kind of speaker came from its potential for creating a theoretically ideal point source of sound. Stories vary on whose idea it was at Altec Lansing, but one source says Carrington authorized the design and did much of the plan work, while Lansing fabricated the actual parts at his L.A. factory. Everyone does agree that Altec Lansing was first in the industry, with the 12-inch model 601 in 1941, followed by 1943's 15-inch 604 (the dates are a bit hazy in the record). The original speaker used field coils in the magnets, but two years later it switched to Alnico V, a WW II innovation. The big Alnico magnets were HEAVY. This led to issues with the woofer basket assembly, which was ultimately replaced in the 604-8G with a larger, sturdier, 16" casting. Later versions of the 604 switched to the smaller, more modern, ferrite magnets. The current 604-8H-II uses ferrite V.
The speaker always came with an external dividing network, usually an N-1500 or N-1600 (referring to the crossover point in Hz), though the circuit design of these evolved with every new model of the speaker. Early models were nominally 16 ohms, then switchable 8/16, finally 8 ohm as a new woofer driver was used in the 604G on. This network is typically considered the weak link in the speaker's design. It's a bit rough around the rather high crossover point. Finally a different network was used starting with the 604H, with two level pots instead of just one, and an EQ feature that many people consider to be an improvement. Third parties such as The Mastering Lab and Iconic have also made crossovers for this speaker. It's been said that one can tell the difference between 70s LPs mixed in JBL studios, and those done on 604s. In fact, this is true. Just ask anyone associated with the old A&M Records. Which was better? You'll never get me to answer. I like them both. By my time, though, the UREI monitors were becoming the hot setup. This one had a 604-series speaker with an additional woofer, in a big box, and was marketed as a "time-aligned" monitor. Time-alignment became something of a buzz word in pro audio and studio design. The difference was audible, plus you could blast the things on a mix all night and not get tired. This is also about when PA technology shifted to stackable or flyable full-range modules with time-aligned or even Duplex drivers, and very high acoustic power output. These, of course, led to the whole "Engine" vogue and today's continued tendency to have it all in one box. Ironically, JBL bought UREI in the 80s. Given that Altec was in Chapter 11 by then, that actually isn't so ironic. As for the 604 itself, Great Plains Audio bought the tools and diagrams for its parts, and continued to support the design. 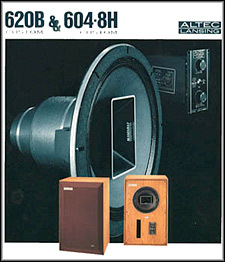 Around 2002, the revived pro division of Altec Lansing Technologies resumed manufacture of the speaker, in its new 604-8L version, but this was considered inferior and did not last long. Currently, if you can afford the money for some real pro-grade equipment made in the USA, you can buy a 604 style speaker from either Great Plains Audio or Iconic, the 604-8H-II or 704-8A respectively. Both of these versions definitely continue the Altec design. 604-8H	 80s? Still made '07 First w/Mantaray horn. Originally had a new (better)xover w/ 2 pots & EQ, 8 ohms. Now (2006) being marketed by Great Plains Audio as the 604-8H-II, $915 retail w/o xover, much cheaper wholesale to the trade. Specs here. The Iconic 704-8A is essentially the same speaker. 604-8K	 1990s	 Dual ferrite magnets, 902 hf driver w/Mantaray horn, 8 ohms, discontinued with rest of Altec line in 1998, Great Plains Audio bought the tools and plans. 604-8L	 2002 - ~2005	 New version listed in the early 2000's by Altec Lansing Professional, discontinued in favor of equipment made in China. Essentially a late K, not highly regarded. Expensive and never widely distributed. 704-8A	 2005 Iconic's version of the Great Plains 604-8H. Choice of xovers. Specs here. 1927: Western Electric (manufacturing and design arm of "the phone company"), provides sound equipment used in The Jazz Singer, one reel of which is a "talking picture." Silent movie era ends. 1927: James Bullough Lansing starts the Lansing Manufacturing Company in Los Angeles, to make speakers for radios. 1928: Western Electric forms ERPI (Electric Research Products, Inc.) for its movie sound business. 1931: First WE 3-way speaker system, using 18" woofer, plus midrange and tweeter horns. 1934: MGM engineering team designs the Shearer System for movie presentation, using Lansing components and Bell Labs research. This gigantic horn design quickly becomes the industry standard, winning an Academy technical citation in 1937. Western Electric comes rather rapidly to dominate the movie sound industry. 1936: In an anti-trust case, the US Supreme Court orders WE to divest certain manufacturing assets, and all of its service contracts with movie theaters. 1937: Lansing introduces the smaller "Iconic" 2-way speaker for studio playback, basically a portable direct-radiator woofer with a huge hf horn on top, flanked by magnet rectifier and crossover. This design remains an industry classic. 1938: Former ERPI engineers buy out the theater contracts and incorporate "All Technical Services Company" (Altec). The contracts are serviced using new old stocks of ERPI parts. No manufacturing capability. 1939: Lansing's business partner dies in an air crash. 1941: Lansing sells his failing business to Altec Services Company, coming in as VP of Engineering, and thus creating the Altec Lansing Corporation. The new company takes over Lansing's Los Angeles plant, and also licenses the manufacture of WE designs covered by the 1938 settlement. 1942: Altec Lansing shifts most of its capacity to war production for the military, though of course motion pictures remain a major industry. 1943: Altec moves to the Taft Building in Hollywood, nearer "the movies" and the Lansing factory. Lansing, Carrington, and others develop the 601, first in Altec's "604" series of legendary "Duplex" speakers. This and the other coaxial speakers marketed by Jensen, Tannoy, Tru-Sonic, and others, will play a huge role in launching home "high fidelity" after the war. About two years later, permanent magnets (a 1930 Jensen innovation) made of the wartime Alnico V, replace field coils and their clumsy rectifiers. 1944: Beginning of the "Voice of the Theatre" series, with the legendary A4 model. By 1945, catalogs show a full line of movie exhibition speakers using PM drivers and improved bass enclosures. These speakers scale to the size of the house, from the mighty A1 (6 15" woofers in 2 huge horns, 4 hf drivers, and weighing over a ton!) to the A6 for screening rooms. 1945: As the war ends, Altec enters consumer products with Duplex speakers, amps, and even television receivers. The TVs, though, are built to Altec's usual professional standards, and don't sell well at their high cost. Management spins off the TV department, which becomes Conrac, maker of industry standard studio monitors. 1946: James Lansing's 5-year no-competition deal expires, and he leaves Altec to form his own company. There is one problem left, which is that Lansing's last name remains the property of the Altec Lansing Corporation. By agreement, Lansing Sound, Inc. changes its name to James B. Lansing Sound, Inc. It begins to market traditional, well-made, Lansing drivers and Iconic-like speaker systems with the new Alnico V magnets. These bear the "Jim Lansing Signature" label, idea being that a person's FULL name remains their property. 1948: Another anti-trust case, the Paramount decision by the US Supreme Court, forces major studios to sell their theater chains. This completely changes movie distribution and financing forever, bringing the era of the indy production and locally owned theaters, greatly altering the nature of theatrical exhibition. 1948: First line of hi-fi gear designed specifically for the home. First AM/FM tuner. 1949: Death, by suicide, of James Lansing. James B. Lansing Sound continues on with William Thomas as president, and finally takes off as a serious player in pro audio. 1949: First Altec condenser mike, the 21B. 1950: Headquarters move from Hollywood to Beverly Hills. 1952: First broadcast studio board, the model 250, an instant industry standard. 1953: Big-screen, stereo movies compete with TV. Magnetic playback requires higher fidelity theater sound. Voice of the Theatre is the only speaker meeting new Academy standards. The big magnetic roadshow exhibitions, especially in special formats like Cinerama, become the best movie playback of all time, until surpassed by IMAX and Omnimax, then finally such hot-rod systems as THX. Every other improvement has been incremental, not fundamental. 1955: The 1949 Voice of the Theater model 800 is somewhat scaled down and refined, becoming the model 820, precursor to the famous A7 home speaker, which generations of DIY tube enthusiasts still swear by, and at. 1955: (Approximate) James B. Lansing Sound finally resolves ongoing friction over the Lansing name by changing the label on its products to the now-famous "JBL." (At some point the exclamation point gets added.) Everyone's happy and the rest is history, with JBLs becoming industry standard musical instrument speakers, and giving Altec a serious run for it in studio monitors. The JBL home audio division produces a line ranging from straight-ahead bookshelf speakers to such truly inspired (if impractical) products as the mighty "Paragon." This latter, rather spectacular, stereo array was designed by the same Richard Ranger who pioneered sync tones on magnetic tape for dual-system movie production. Solving the problem of tape slippage makes truly hand-held cinematography possible, and, along with quieter 16mm equipment, makes the 60s documentary film movement possible. 1956: Altec Lansing Corporation goes public as Altec Companies, Inc.
1958: Altec moves all operations in Los Angeles, Beverly Hills, and New York to a large new factory in rapidly developing Anaheim, CA (yes, near Disneyland). 1959: Altec merges with nearby Ling Electronics, becoming Ling-Altec. 1960: Ling-Altec merges with defense aerospace contractors Temco and Vought, creating the jawbreaking company name of LTV Ling Altec. 1966: Plant space doubles, company now employs 680 people. 1968: Altec introduces AcoustaVoice, the visionary system of room equalization installed by trained contractors using 1/3-octave band EQ and an awesome battery of calibrated test equipment. 1969: Sidney Harman (Harman-Kardon) acquires JBL, gaining a major foothold in the raw driver market. Beatrice Foods, of all people, buys the entire Harman group, but decides to get out of the hi-fi business in the 80s, at which point Harman buys JBL back. 1971: Rollout of AcoustaVoicing, an evolved system with active 1/3-octave graphic EQ stacks (AcooustaVoice model 9860A), and a real-time analyzer (model 8050A) for setup. This becomes reasonable enough even to install in the home. 1972: Bloated parent conglomerate Ling-Temco-Vought begins spinning off subsidiaries, and Ling-Altec becomes the public Altec Corporation. By 1974, sales are nearly $60 million a year, and in 1975 they will claim 1000 employees, more than JBL. Apparently, though, the company can never overcome debts stemming from the spinoff. 1978: Introduction of Mantaray series constant-directivity horns. 1983: Altec files for Chapter 11 bankruptcy and goes into reorganization. The consumer products division is sold to Sparkomatic Corporation, makers of auto accesories and car radios. Remaining manufacturing moves to Oklahoma City, with other operations to follow a year later. 1984: Altec Corporation consolidates all operations in Oklahoma City. JBL carries on in the theater speaker market, being selected for the upgraded system in the motion picture academy's Sam Goldwyn Theater, where sound Oscars are won or lost. JBL also forges ahead in the studio market, with its acquisition of Urei, respected in serious recording circles for a "time aligned" monitor series that started out using (ironically) the Altec 604. UREI continues to produce popular studio control monitors and an optoisolator-based compressor, using non-Altec drivers. 1985: Gulton Industries, already the new owner of Electro-Voice, buys all Altec assets, creating a division called the Altec Lansing Corporation. 1986: As corporate wars continue, Gulton is acquired by Mark IV Industries, a multinational conglomerate which places Altec and Electro-Voice under Mark IV Pro Audio Group, along with Vega, Klark-Teknik, Midas, DDA, Dynacord, and University Sound. 1993: Introduction of the popular 9864 Acoustic Engine, a self-contained module with a dual-magnet, high-power, very high output, point-source, Duplex speaker in a very compact horn enclosure. Various Engine configurations become popular for churches and auditoriums. 1996: Altec opens a manufacturing plant in Dongguan, People's Republic of China. 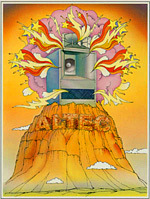 2002: Altec Lansing Technologies re-opens the pro audio division as Altec Lansing Professional. Products are mostly ceiling speakers and engine type boxes targeted at houses of worship. A revived "L" version of the 604 is also offered for a time. 2003: Altec Lansing Technologies begins selling a legacy A7 Voice of the Theatre, using original plans, but with a 900-hz crossover, and an almost scary 200W power handling. $6000 (which includes shipping), and it's yours. You need two for stereo. ~2005: Altec Lansing Professional discontinues its latter-day version of the 604 series speakers, to the dismay of nobody at all. 2006: Great Plains Audio and Iconic, LLC market a revived version of the 604-8H. Altec Lansing, Duplex, and Voice of the Theatre are all registered trademarks of Altec Lansing Technologies Corporation. Cinerama is a registered trademark of Cinerama, Inc.
Great Plains Audio, Pascalite, and The Engine are all trademarks of Great Plains Audio, Inc..
IMAX is a registered trademark of The IMAX Corporation, Toronto, Canada. JBL is a registered trademark of Harman International Industries, Inc.
Lansing and The Sound of Experience are registered trademarks of The Altec Corporation. Mantaray and Iconic are registered trademarks of the Iconic Manufacturing Company, LLC. Western Electric is a registered trademark of Lucent Technologies Inc., formerly AT&T Technologies, Inc., licensed to Westrex Corp., formerly Western Electric Export Corporation, a company independent of Lucent.